This adapter features a female M49 thread on one side and a male T / T2 thread on the other side. It is made of aluminum and black anodized. 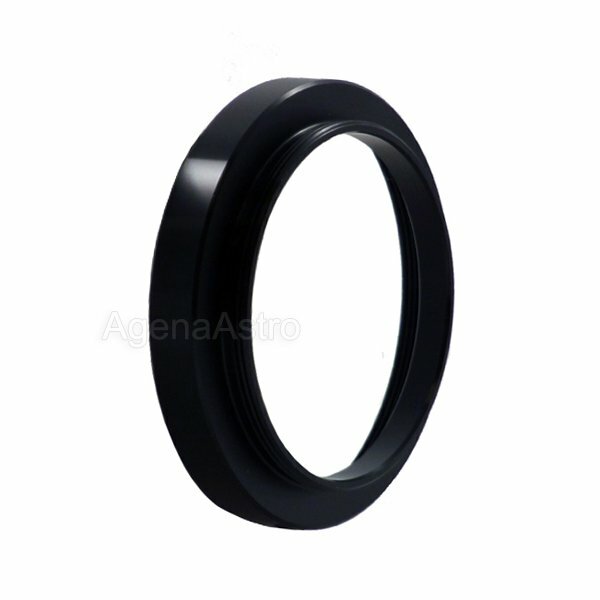 Please note that this adapter is only meant to be used with specific Agena UWA eyepieces as mentioned above. It will not work with any other eyepiece that does not feature an integrated M49 male thread. I do a significant amount of astroimaging with a DSLR in all forms, prime focus, EP projection, afocal. Some of the EPs I use have adapters with M49 male threads. I wanted to adapt those EPs to the DSLR's EOS system. This is the perfect adapter for doing that straightforwardly with the male t-threads screwing into a t-thread/EOS adapter. These adapters having M49 female threads on one end and male Ts on the other are NOT easy to find, and Agena has them and at a good value, as well. I use several Blue Fireball extensions, adapters, and the like from Agena Astro. I've NEVER been dissatisfied with their products.